There’s no point in making internet far reaching if the only thing they learn from it is how to troll progressive voices and how to de-legitimise someone’s struggle for freedom of religion and human rights. You can’t educate people by preaching but you can educate people by your actions. He was offered to fight the case of Mumtaz Qadri and he flat out refused it. He led by the example of how to refuse fame if it means losing your core values. He educated people, not by highlighting himself, but by highlighting and fighting for an innocent man (mashal Khan). Imran had cricket as his platform to fight for his cause, I respect that, but Jibran only had his skills as a lawyer to fight for the poor and down trodden. You are right in saying that you can educate people by preaching, but you can educate people by your actions and Jibran Nasir have done it time and time again. Had it not been for him, Khadeeja stabbing case would’ve had no or very little media coverage. He filed a petition in the Supreme Court for the reformation of judicial process, specially focusing on the loopholes that are causing the delay in justice. You can only do so much as an individual and if you think that having a high self-esteem is equivalent to holier than thou attitude then there is no point in trying to explain my point of view to you. You can do way more. Why is he so hell bent on criticizing PTI in Karachi? Labelling PIT as extremists? Why doesn't he make an NGO for minorities? You are the captain of a ship in rough waters. The ship is broken and water is flowing inside. Imran Khan is saying we need a totally new ship. Jibran is saying we should drink the water and spit it outside. Maybe if he put his ego away, he could work for Imran Khan. Actually he could’ve, had it not been for the disqualified crooks like Jahangeer Tareen and religious bigots like Amir Liaquat Hussain, who are now more important to IK then his principles. But I am glad you see Jibran’s ego as a bigger issue. Well he’s the chairman of an NGO that was carrying the injured ones and bodies of the lives lost in Mastung blast to the hospitals and morgues respectively. Making an NGO for minorities is exactly a stop gap measure that is an equivalent of ‘saying we should drink the water and spit it outside.’ By the way I do agree with IK that ‘the ship is broken’ and we need a totally new ship. But what’s the point of buying the new ship if you’re buying it from the guys who sold you those flimsy ships in the first place. That would just be tempting fate. Nothing impressive about him and I know him better than anyone here. I don't know about you, but for sure Jibran Nasir has country wide following. What Jibran Nasir did, no one else was able to done/achieve in Pakistan up till now. He is a beacon of light for many. There are many who are unsatisfied with Imran Khan's policies of becoming Quite on issues like banned terrorist outfits, their taking part in the elections, and members of PTI itself seeking their blessings, while IK still not saying one word to his members. IK is not a man of principles, but a man of politics with low level of morals. Iran Khan is ready to sell his morals and principles for the votes. Jibran Nasir is a man of principles. He is ready to loose votes for his morals and principles. This distinguishes him from Imran Khan. I didn't support the Dharna by PTI against rigging and maintained that parliamentary/judicial forums should be used. Today when various political parties who lost are hinting towards another series of protests I have the same request. Lead the country out of crisis not into it. JN showing more political principle and sound reasoning than the likes of Siraj ul Haq, Fazlur Rehman, Shabaz Sharif and even IK (after 2013 election). And right there is my issue with him, he's compared an apple to an orange. IK exhausted every legal avenue and was then forced to start the dharna, to me he sounds seriously IK-Phobic, almost like he knows anything he ever does will be pale into insignificance in comparison, therefore he aligns himself as the only true hero and misaligns IK with the patwari's and Jahils. What he fails to understand is following this path he'll forever be stuck out in the margins because he's simply trying to please the dawn editorial board and the majority of Pakistanis appreciate what IK is trying to do in comparison to the others. Let's say he does mean well and his principle of sticking 100% to his principles with no room for manoeuvre (which I personally have serious doubts about with him being in bed with the Pashteen crew who had some serious dodgy ppl, not least Mohsin Dawar) allows him to sleep well, does that make it ok for him to not to join a coalition with someone he doesn't agree with,say JUIF so he can gain control over a province and start putting some of his plans into action? He was educated in Lyceum and did well standing up against Rao Anwar and stood up for that lawyer lady who was stabbed. Apparently you are taking him seriously enough to write such a long post about him. I know principled stance is an alien concept for many people but that’s exactly what it means to not give up on your principles. He criticises Imran based Imran surrounding himself with proven crooks like Jahangir Tareen and proven lotas like Shah Mahmood Quraishi and Fawad Chaudhry. I understand that you don’t like Dawn News editorial board but some people don’t like ARY. So if we go by that logic, IK does everything to appeal to the editorial policies of ARY. But hey, I’m not the one judging him. I wonder how you were able to found a fault in JN in this case. If IK exhausted every legal way, then either he had to resign, or to accept the results as he done after the dharna. JN is right that this Dharnas didn't bring any positive for Pakistan. And I wonder what answer I could give when you are angry upon JN while you think he does not have a right to criticized Imran Khan every time he feels, but perhaps he is only allowed only a specific number of times that you would prescribe. So please give him the right to disagree with Imran Khan and to criticize him as much as he wants. IK has not been criticized severely for making a government with MMA, but he has been criticized heavily for supporting the paradigm of Mullahs. It was Imran Khan who was supporting the terrorists of Lal masjid. He went to the Lal Mosque after the operation and delivered a speech there after Jumah prayer. IK always opposed military operation against Taliban. IK supported the Sharia system of Sufi Muhammad in Swat. IK used the Khatam-e-nabuwat bill for his personal gains. IK and his party members used the support of Sipah Sahaba in the elections. and the list goes and goes. Not an achievement. If you're counting that in someone's achievements list, it's very sad. You can’t see past anything else because once he spoke about your narrative. Try to understand broader picture and then maybe you’ll understand. Guess you’d know something about broader picture that we don’t? Glad you cherry picked the Lyceum part and not the ‘standing up against Rao Anwar’ part. Good for you! I'm not lol.I'm just pointing out that he studied in Lyceum,not Southshore as Slog said. I have read your comments. Your understanding of Pakistan's politics is minimum. You want things to change right away. It will take time, it has to be done with support of the people and the only way that can be achieve is by educating people not insulting them and by insulting, i meant blowing kissed on the street to those who didn't agree with you, childish. He has a perfect platform to bring people closer instead using antagonizing approach. His speech, not speaking ill about Ahmedi is the perfect example of he can make a difference. Insult the politician but not the ordinary people on the street even if they call you names. Pakistan is majority a sunni country, it'll take time for minority to get the rights that you are trying to promote. And, I believe it will happen. Jibran Nasir criticizing IK for dharna shows his understanding of Pakistan's politics. It comes off of as if he is criticizing for the sake of criticism when there is no criticism. IK had people's support because it was the truth, NOora or any other political party can't do the same for the obvious reason. So for anyone to say IK was wrong in doing that is just harping out what they have heard from someone without giving it to any thought just because they have highlighted their narrative. Remember the solution is political. Please enlighten me. What is the right ‘political’ approach? I’m just curious. I’m sure people supported IK in his dharna. I’m sure he’s had millions of followers. I’m sure he knows his audience. I’m sure he’s doing all he can to make the change we desperately need. But I’m also sure that Nawaz Sharif also had people following him. Every politician has the backing of a certain amount of people. If you want to break the circle of rigging and rigging allegations, you got to acknowledge everyone’s mandate. You can’t have double standards. I may not be completely in sink with the political realities of Pakistan, but I do know that you can’t brush everything under the carpet and pretend that you’re going to change Pakistan. This comment of yours validate what i have said in my initial reply to your comment. PTI won for the reason and EU and other independent entity has said there was no rigging in Election. And please do not reply there was pre-rigging, it is a laughable defense. Even IK has said he would support every investigation if required. Like I have said, you and other are harping out what they have heard without using critical thinking and criticizing Pakistan just because you heard someone said something. But why do you hate JN when he says exactly the same thing. The only difference between you and his point is you think IK was right for doing dharna while he says both Imran and him were wrong. You want me to not say anything about pre-poll rigging but the source you are citing says exactly the same thing. I may or may not believe them but it is your citation. I call people out when they call Imran Taliban sympathiser but I cannot forget that he milked the issue of Khatm-e-Naboowat for his political gains. You can’t actually change these facts. Please re-read my comments and point out where did I say I hate JN, rather I said he should continue what he had been trying to do but change his approach to get more people on his side instead antagonizing approach. Please, can you point out where did I say I hate Jibran Nasir, Thank you. Pre-poll rigging is a joke and probably the weakest to cling on by western media and those who do not agree with him because that is all they have since no report or evidence of rigging, do not fool yourself. Now, can you point out where I said I hate Jibran Nasir, thank you. What an immature guy. Imran gave dharnas after his LEGAL rights were denied. Imrans dharnas is the reason why he’s in power and why Pakistan is set for a change.if he had sit home and just accepted the rigging without any reform to the process we would be nowhere. My guess is the only people that dont like him are the rabid mullah brigade because he speaks out in favor of minorities, specially ahmedis who mullahs are especially afraid of. Otherwise, Jibran Nasir’s movement, whether or not he wins any seats, has already been successful in raising the stature of the political process in Pakistan and asking tough questions that we as a society need to answer if we are to evolve. He is putting his life on the line to do so, as we all know how little it tales for some crazy mullah to pull the trigger. Another ill-informed post from you. Nothing impressive about him? Who led the protests against Mullah Aziz while the whole Pakistan was afraid to do so. Please do some research on him regarding his campaigns and how he stepped forward to be the lawyer of Shahzaib and Naqeebullah while no other lawyer was willing to take up these cases. ‘You fell for it again’ implies a certain amount of deception. I you think he’s deceitful then you certainly don’t have positive opinion about him. Perhaps hate was too strong a word to describe your opinion of him, but you might as well have said it. And noone is stopping them doing so. As for JN, I admire his values and respect him. But he is putting his life on the line. Unfortunately, that comes with the territory. Now you are going to 'think' for me and tell me what I meant to say and interpret into something that I have never said even after I praised him for highlighting the issues that I agree? You have comprehension issue, I criticized his approach in getting the people of Pakistan together to fight for the rights of minority instead antagonizing. RE-READ my comments again and come back to me and point out where did I say 'I hate him or insinuate in any way that 'I hate him', please try again. My opinion of him, since you have a hard time in comprehension and you can't counter-argue the points I have raised you have resorted to interpret comments in a way that make you happy, I will write it again for you so you can comprehend, again. I support his vision, I want him to be successful in the struggle that he is fighting for and I hope instead of using elementary approach he should try to gain support of ordinary citizens so he can fulfill what he wants to achieve. deceitful? Leave out your pre-formed thinking before getting into debate again, not everyone is out to get you. Stop being paranoid. Positive opinion, you seriously have comprehension issue. Please point out where I said I do not have positive opinion of him since you got in to discussion with me, criticizing his approach isn't and does not translate into not having a positive opinion. Next time try to listen and try to understand what other is trying to say and I know at times it becomes hard to understand when you believe everyone is out to get you just because what you believe in but read it slowly and understand then maybe you'll be able to understand and differentiate between positive criticism and negative criticism. Who has stopped them, they should? If you do not mind, How old are you? I’m not thinking anything for you. I just gave you an example. You may choose to accept that your choice of words were poor or you don’t mind me inferring from those words that you probably don’t like him. The Choice is yours. Do you have evidence from any source that rigging took place and if it did why aren't they doing Dharna? Has IK or anyone stopped them? No one has criticized PML-N for not doing dharna or want to do dharna, every sane human being is criticizing them for claiming something that never happened? Choice of words from you was poor in claiming that "I hate him", you couldn't provide any evidence of that so you deviated to that i believe he is "deceitful'. You are translating words into your head for your level of thinking. Amazing. I suggest you to try again. counter my criticism but i am sure you won't be able to due to your inability to carry on a debate. Last edited by slipcatch; 28th July 2018 at 21:39. Do you remember IK’s 35 puncture claim. Was it ever proved. This is what happen when you go all gung ho about dharna politics. You just have to look at pro-PTI analysts on ARY to see that they would rather make fun of PML-N’s allegations instead of being serious about these irregularities. By the way, I am not implying that there was any rigging. I am just saying that when you start politics of allegations, you better prepare yourself to be held on higher level of accountability. I just told you that you said to me, ‘you fell for it again’. Can you explain to me what you meant by it, otherwise it is just an open ended phrase, susceptible to any type of interpretation. But still I apologise to you if you think my perception of you is wrong. 1. Everything becomes HALAL when it comes to Imran Khan. 2. I asked earlier ballot papers in Kachra Kandi. The answer of PTI members was N-league does not have any right to weep this time when Agencies are rigging for Imran Khan. Again the conclusion was Every Rigging is Halal when it comes to Imran Khan. 3. Here you have the answer why Jibran Nasir left PTI. He prefers morals and principles over votes. While Imran Khan prefers votes upon principles and morals. Sorry, I am new and don't know how to insert twitter tweet in the posts. Here is the screen short. I trust Imran Khan that when he takes support from these bigots he will also keep them under a tight leash, as he will never compromise with his own principles. Regarding rigging, one must see the greater good, and if the outcome is good for Pakistan, then why not? The papers that could be salvaged from the dump included several which were stamped in favour of the Pakistan Peoples Party candidate Moazzam Ali Qureshi. Congratulations to Jibran Nasir for increasing his vote tally from 250 odd to 2500. That is a 10 fold increase. He also increased his standing in the constituency from 15+ to 5th. Well done buddy. Maybe if the trend continues he could get into top three in the next two three elections. I trust Imran Khan that when he takes support from these bigots he will also keep them under a tight leash, as he will never compromise with his own principles. I am afraid Imran Khan is opposite to what you said. He is not a man of principles, but he sells his principles for votes. We already saw it how Imran behaved in all the matter about Ahmadis, although he claimed initially that he will provide Justice to Ahmadis. Imran Khan uttered no single word against Lal mosque terrorists, and after the operation he even went to lal mosque and delivered a speech there, where he legitimized their terrorism. Same Imran Khan again uttered no words when Khadim Rizvi was doing terrorism in Islamabad. Actually Imran Khan played the Khatame Nabuwat card himself, and this is a shame. Religion should not be used in politics. And biggest question is what is the first place need for asking any help from these terrorist organisations? You claim that Imran will take control of these banned outfits. But how? 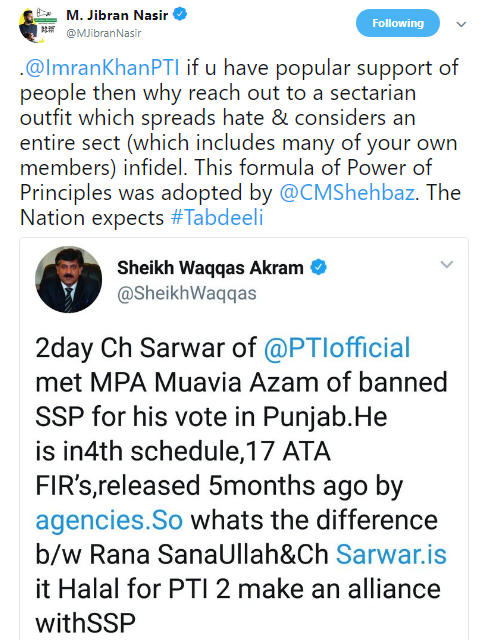 He is not even able to take control of his own party members who were seeking the blessings of these outfits, how then Imran Khan is going to control these banned outfits? Regarding rigging, one must see the greater good, and if the outcome is good for Pakistan, then why not? So, you mean this was Halal rigging? Looking at level of your criticism, I remember the story of father and son who were riding the donkey, and whatever they did, but PEOPLE were always able to find any criticism upon them. No doubt, one could not make everybody happy, and there are some whom you could make never happy and they will always come up with any blame upon you. Again the same standard of blame as above. Ch Sarwar has spent the last few days meeting independents across Punjab. But be in no doubt, PTI will NOT form any alliance with Muavya Azam MPA’s party. A very lame excuse. If you didn't want his support why then you even met with him? Question is why Imran Khan went against the Law and didn't stop his candidates from meeting the banned outfits at the first place? Question is, why Imran Khan didn't protested when the terrorist outfits were allowed to participate in the elections and thus endangering Pakistan to land in the black list? All this was against the law and against the interests of Pakistan. But Imran Khan has no principles and morals like Jibran Nasir. Your desperation in every thread is very amusing for the rest of us..... carry on. I think he got around 6000+ votes. Why is his tweet always comes off of as confrontation against the same ordinary people he is trying to govern and work for? His fight is against the people who make laws not ordinary citizens on the streets. Why is it hard for any one to understand. All great leaders who fought against oppression and racism they fought those who implemented the law not the ordinary citizens. He's creating a siege mentality. It tells me he's gonna planning to be in protest politics for the time being. It's easier than actually changing things like IK has. Cleverly worded. Maybe I'm a cynic but I see how he's framed this in the best possible way so those reading quickly and ignorantly automatically assume PTI is ok with these thugs getting bailed. It’s very brave of JN to call out bigotry. I’m sure that not every ordinary man is a bigot and JN never said that every ordinary man is a bigot. Off course you can’t praise hate speech, blasphemy allegations and violent behaviour and you cannot stay silent on such issues. But off course if people think that an average joe is a bigot then it’s their opinion. What happened to Arif Khan. I’m genuinely curious, not in any demeaning way. Huge respect. Has PTI, PMLN, MMA, anyone from BAP or any other major political institution made any provision for these people? Things are looking a bit fluid right now, so I wouldn’t hold the federal government or Balochistan government accountable yet. Easily my most fav Pakistani along with Eidhi sahab and Dr Adib Rizvi. A hero and a humanitatian in its truest of sense. Started following him 5 years back when he did relief work for flood victims but it all changed for Jibran after the blast in Abbas town and he started activism and became the bravest voice in Pakistan for the oppressed irrespective of their cast, religion , region etc. I can write 200 lines on the work he has done in last 5 years but no point arguing with those who are sitting behind their keyboards and calling him attention seeker and wannnabe TV star. As Jibran's bio says (A quote from Eidhi sahab) " Make the enemy redundant by the power of personal example". Hopefully with time these people open their eyes and see what Jibran has done for Pakistan. Jibran and Eidhi's life has taught me one thing that yes 1 COMMON man can bring real change. It was pretty amusing to watch him destroy Rana Sannah Ullah. Shame on Rana Sana Ullah. I still can't believe he has been reelected. The way we are going, we’ll probably end up with having reserved seats in national and provincial assemblies for bigots and terrorists. Some good points about general public attitude and why tabdeeli is so difficult. Last edited by Abdullah719; 1st August 2018 at 03:58. Excellent work from JN raising this important issue and doing something for ordinary man of Pakistan. For those who question Jibtan, as my post was deleted in other thread this is something similar to what I wrote (can't remember the exact content). Akela Jibran has done more for Pakistan than thousands of Pakistanis combined in last 5-6 years starting back to his relief work for flood victims which provided meal for over 4000 families and started activism after Abbas town blast in 2013.. Even on this 14th august he ran a blood drive campaign in 9 cities of Pakistan which will potentialy save 1000 lives while we are sitting behind our keyboards or celebrated Indipendence day with Jhandian. Kia zarorat hai usay ye sab krnay ki?? Araam sai ghar bethay aur Pakistan Zindabaad k naray lagaye as this is what makes one patriotic in Pakistan rather saving lives and working for people. And i won't even put this blood drive thing in the top 15 things Jibran has done in last 5-6 years. As much as I admire this effort this doesn't require any bravery and Jibran has put some brave efforts in past (for peope of Pakiatan) which not even 1 percent of us can even think of. Give it a rest mate.... exaggerating his worth, you can't fool people all the time. We saw what he is .... first class attention seeking douche. Deliberately Orchestrating controversy, so he can make noise on social media and play to the narrative that sells in western galleries.